*This post was originally published on January 25, 2018 at LDSCharlotte Mason.com. I’ve been homeschooling since 1998, and for most of our homeschooling years (11 of those years, to be exact), I tried to follow the ideas found in the book “A Thomas Jefferson Education.” I attended every TJEd seminar and conference I could get to, and I eventually taught the principles at TJEd conferences and in my own community. I started and ran a state-wide TJEd group in my state, and solidly believed in the principles. That is not to say that I implemented the TJEd method perfectly in my home. Looking back, I am sure that I had formed some vast misunderstandings of how to “do” TJEd. I truly believed that my kids would beg to learn when they wanted to, and that they should be the ones to design their own learning, charting their own courses for their lives. I personally translated TJEd to be unschooling with classic novels strategically placed around my home, reading classics aloud, all while inspiring my kids to be leaders by watching me teach and lead other moms in my community. It all made perfect sense to me all through those years, until my oldest children started to leave home, which showed me where we succeeded, and also where we had floundered in my homeschooling. "You have not taught your children light and truth, according to the commandments; and that wicked one hath power, as yet, over you, and this is the cause of your affliction." 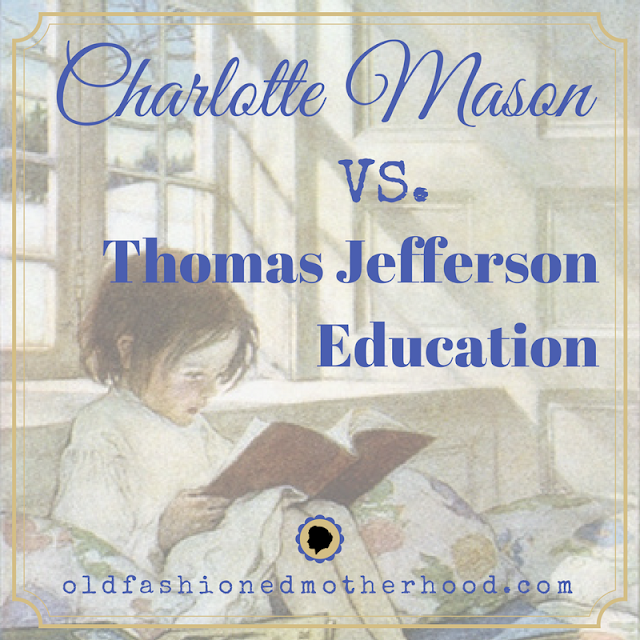 After some devastating educational and spiritual failures in our family, in the year 2013 I abandoned my unschooling ways, and turned to an intense study of Charlotte Mason. There I found all the high expectations and structure our children needed, and yet discovered that Miss Mason’s methodology maintained the beauty and inspiration I desired to expose my children to. I want to be frank about my failings as a TJEd homeschooler simply because I want you, as readers of this article, to understand why certain differences between TJEd and Charlotte Mason’s methods stand out so starkly for me in my own personal homeschooling journey. I do not claim to be an expert in either TJEd nor in Charlotte Mason. However, I am a homeschooling mother of many who has used both methodologies with her children, and I feel privileged to share my personal experiences and insights with others. Since there often seems to be some confusion among some homeschoolers about the differences between TJEd and Charlotte Mason, I’d like to begin by sharing the things the two methods have in common. Students should read good, classic/living books and avoid boring textbooks. The learning environment and atmosphere should be rich and inspiring. Classical influences of great authors, artists, composers, music, such as Shakespeare and Plutarch are shared and embraced. Small children should not be pushed to perform academically at a young age. Good habits and principles should be taught in the younger years, and throughout the life of the child. Customized education is needed for individual children. (“Children are persons”). Learning becomes more rigorous as the student grows. Mother-Culture/Inspiring Parents are pivotal to learning success. Charlotte Mason espouses structured, planned learning time vs. unstructured learning with lessons in specified areas of study, such as Art Study, Music Study, Geography, History, Nature Study, Poetry, and Shakespeare. TJEd students only study subjects that interest them, which will eventually help them in their life’s missions. CM embraces the ideas of parental academic requirements, expectations, and assignments with follow-through for the work assigned. Oral and/or written narrations are assigned in CM to be done by the students, versus the TJEd emphasis on casual book discussions being held as a group. Habits and character training are more strongly emphasized in CM with the goal of establishing full attention and best efforts in the students. In a Charlotte Mason homeschool, the learning is parent-led (Spreading a Feast of Ideas) as opposed to child-led, passion-driven learning. Developing academic skills in handwriting, spelling, arithmetic, recitation, and memorization are expectations with continuous, gradual, incremental improvement, rather than the relaxed expectations on reading and math skills of TJEd practitioners (“They’ll learn it eventually...”). The goal in CM is to expose children to living thoughts and ideas (“The question is not, -- how much does the youth know? when he has finished his education -- but how much does he care?” ~Charlotte Mason); TJEd emphasizes that youth have important “life missions” to perform, but this is a vague, undefined goal that will come to light later in their futures. I want to emphasize once again that I believe I may have misinterpreted TJEd principles and ideals in my own homeschool. But I DO know how my teaching in my home has changed since I switched to following the Charlotte Mason method. Using TJEd, our home environment was helpful and important. But looking back, I can now see that our environment of rich resources and lovely, living books was not enough. I worked hard to set an example of personal study and a thirst for learning, but it was not enough. What we needed was consistent, every day, regularly-scheduled home-schooling time with scheduled subjects of study and a plan to follow. and let them do what is right at the sacrifices of ease and pleasure." Even though we have made MANY changes since embracing the Charlotte Mason model, there are many things that have stayed the same in our homeschool. We still read lots of good books together, and on our own. We gather to discuss great ideas and great books and other great works. We work hard to teach our children to recognize and develop good habits and virtue. Each individual has personal interests they pursue, as part of, but also beyond, their academic studies. We all work together to take care of our home, yard, and each other. We are active in our homeschool group and within the homeschool community. We try to keep our focus on God and family. A greater focus on building good habits and communicating high expectations of the students to give their best efforts to their academic work. Daily academic assignments are given to each child over the age of six years old. Oral and Written narrations are now assigned for each book read and subject studied by our children. Each child has a list of books assigned to them to read and to narrate. Each day we have group lessons in the weekly subjects of History, Art study, Music study, Geography, Shakespeare, and Nature study. Each child has daily assignments of math lessons. I follow through with each child on the assignments that have been given, and keep a record of the work they have accomplished. "...seek ye diligently and teach one another words of wisdom; yea, seek ye out of the best books words of wisdom, seek learning even by study and also by faith; Organize yourselves; prepare every needful thing, and establish a house, even a house of prayer, a house of fasting, a house of faith, a house of learning, a house of glory, a house of order, a house of God;"
Because of these changes, greater expectations and accountability have been established in our homeschool, we are learning that we all have to do difficult things we don't necessarily want to do-- and that's life! Everyone is also feeling a greater sense of accomplishment and progress in our educational efforts. As I ponder on how our homeschool has changed over these last few years, I can see how making well-thought out plans give us direction that was sorely missed in our unstructured studies. Rather than having too many choices to choose from, and an enigmatic goal of “a life’s mission,” my children now know what they need to do and when they need to do it. I customize their individual learning through the booklists I make for them, and the assignments I give them, as directed by the Holy Ghost through prayer. Instead of leaving my children to try to figure out what they needed to learn, and when they needed to learn it, they now have parental guidance and life experience to help them meet their futures with greater confidence. Each child can study and work with tangible goals in mind, rather than not knowing which direction they should turn next. I see Charlotte Mason’s methods as a beautiful roadmap that opens up a path of purposeful inspiration to parents that will help them guide their children. I love her reminder that parents are the divinely appointed teachers of their children, and that the Holy Ghost guides mothers and fathers to the resources and lessons that each child needs. The peace and order that has come to our family as a result will bless all our children in the many years of homeschooling that still lie ahead of us.